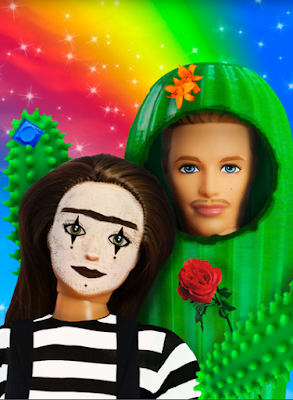 A Cactus and a Mime walk into a room and begin to re-enact their tumultuous relationship in the style of a children's television show. You would be hard pressed to get any more fringe than that. Written and performed by Roby Favretto and Caitlin Spears and presented as part of the Melbourne Fringe Festival, Cactus and the Mime is a hilariously fast-paced satirical look at the relationship between two people and the circumstances that have led them to present their story to us. The show begins as Hi-5 as you can possibly get with Trevor and Mandy donning big smiling faces, adorable costumes and the staged decorated with brightly coloured props. However, as the story progresses, there are glimpses of something darker at play here. Yes, they're all smiles and cheeky banter but there's something brewing underneath it all that Trevor and Mandy will ultimately need to face. As the jokes become more vicious and personal, the elephant in the room is revealed and it is absolutely devastating. Suddenly, we don't care about how cheated Trevor feels about only receiving an honourable mention at his school talent show or about Mandy's career aspirations to becoming a famous mime. What we care about are these people, their relationship and what they are facing. Within this re-enactment, there is a blurring of what is performance and what is real as Mandy and Trevor often break out of character to deal with problems arising in the actual show and discussing the logistical issues that occur. Should they ignore dramaturgical inconsistencies for the sake of theatre? What happens if someone goes off script? And is it acceptable for Trevor to block Mandy's offers? The idea that we are all constantly performing for others and how life cannot follow the same rules of theatre begins to seep through this work and support the darker tone that eventually envelops Cactus and the Mime. Favretto and Spears have clearly worked on this script for quite some time as there is no filler or lulls in the story. They do not compromise the integrity of the narrative or their characters for the sake of a laugh, as each joke goes further into highlighting their personalities or what they love/hate about the other person. Christian Taylor is credited as dramaturg for this production and after his win for best emerging writer at last year's Melbourne Fringe Festival for his show How Can You Sleep At Night?, you can see how Cactus and the Mime retains its heart. Under the guise of a children's TV show, we come to know how Trevor and Mandy's innocence and naivety was shattered when reality threw them a curveball. Cactus and the Mime is about how people choose to deal with tragedy and the pain of not being able to move on from it. Beneath the jokes and smiles, hearts are broken and lives are irrevocably damaged in this original and captivating show by Favretto and Spears that dares to take risks and reaps all the awards because of it.